http://annesastronomynews.com/burst-of-light-discovered-in-a-suspected-binary-protostar/ic-348/. Below the star cluster is a dark cloud of dust known as Barnard 4. This dust extends off to the right into the reddish area of the image. The right side is called Barnard 3. A large reddish nebula glows behind this dust and is known as Lynds Dark Nebula (LDN) 1470. Another dark and dusty cloud is known as Barnard 5 and is located roughly between the bright star Atik near center and the bright star in the upper left. Many tiny galaxies are also in the image. An annotated image listing of these objects is linked here. 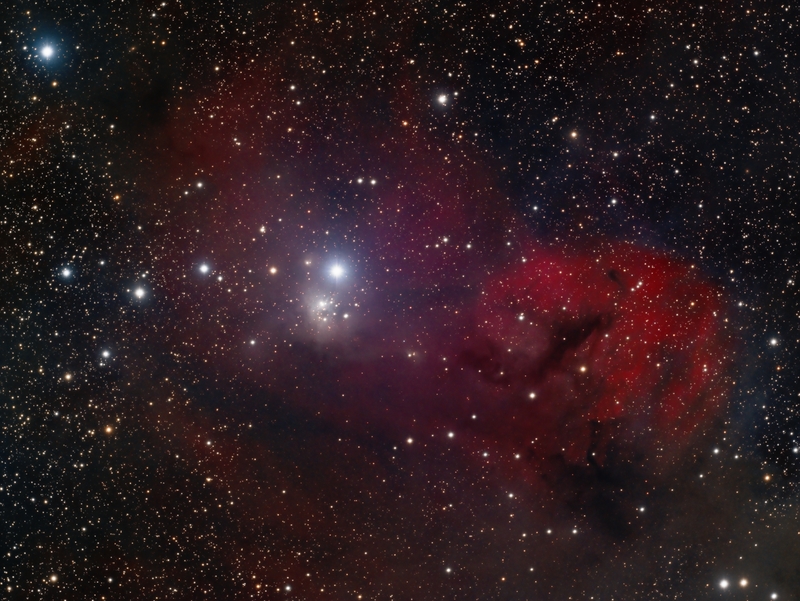 This image is a blend of 15hrs of RGB and 10hrs of Ha data.